Days before Jim Scott announced his retirement my telephone rang. On the other end of the telephone was that friendly and commanding voice. “Darryl! It’s Jim Scott!” That’s the way his calls always began. He called to tell me he was retiring and wanted me to know before I found out through others. We spoke for about 10 minutes or so. After finishing the call, I sat quietly for a moment and I’ll admit I choked up. This was the end of another era in Cincinnati’s rich broadcast history. 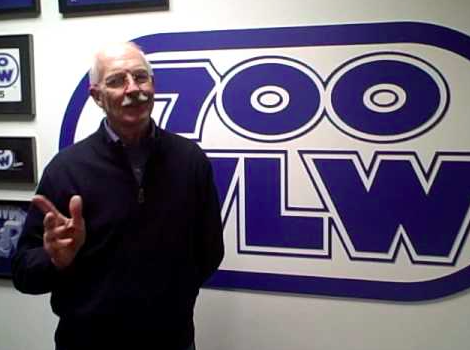 Jim Scott, like Gary Burbank before him, leaving 700WLW and ending their decades in radio. Decades of informing, entertaining and being the best radio companions. Cities like Cincinnati are extremely provincial. Neighborhoods are strong. Some say our communities are closed to outsiders. Some of that maybe true. But, if you stick it out, once you belong, you will find the closest of friendships. Our little area of the Midwest is a very special place. Now imagine that close friendship with over 2 million people. That’s how many people Jim Scott considers his friends – the entire market. I’m guessing that’s how many people might consider Jim a friend too. As the radio story goes, when Jim first arrived in Cincinnati from WKBW in Buffalo, he made it a point to introduce himself to everyone. And I mean everyone. He’d finish his morning show on WSAI and then head to Cincinnati’s Fountain Square where he’d hand flowers to women and ask them to listen to him. Other days, Jim would literally knock on doors, going house to house, neighborhood to neighborhood, introducing himself and asking those that answered if they would listen. That was decades ago and he never stopped. Years ago, at a wedding reception at Cincinnati’s beautiful art deco Union Terminal, I was standing with a small group of people, including Rich Walburg, my programming partner in crime at 700WLW. Another in the group noticed Jim going table to table introducing himself. The fellow said, “Is that Jim Scott? I want to meet him.” Rich in his driest delivery replied, “Stay here. He’ll make his way over.” He eventually did and Jim introduced himself. Jim has a way to make everyone feel special and he really is interested in how you’re doing. He has a deep compassion for people. He’s a radio personality who understands his on-air role, the importance of being an active member of the community and the value of his personal brand in the market. He treasures his relationship with listeners and advertisers. He knows ratings must come with revenue. Jim is actively involved with many of our community’s service organizations and charities, because he knows how important it is to give back. Being involved in community service is normally the job of a radio station’s Market Manager. That wasn’t the case at 700WLW. I joked over the years, we had no idea what he did. We just knew at night he was representing the station at a fundraiser and the next morning he was on the air at 5am. What I respect the most about Jim is his competitiveness. For most of his years in Cincinnati his morning show has been dominant. But, there was this one time that Jim’s show fell to #2 with people between the ages of 25-54, the so-called money demo. He lost by one-tenth of a point, I believe to the Bob & Tom show. This may have been the only time I saw Jim mad. Well maybe not mad…aggravated. I tried explaining the difference fell within the statistical error of the ratings and not to worry. It didn’t help. Later that day, after he left, I wrote him a note and slipped it under his office door. It said, “We’ll get the bastards next time.” It became our running joke. A number of years later, Jim was on vacation, in Ireland, golfing with his son. One early afternoon my telephone rang. “Darryl! It’s Jim Scott!” Unsure if he was still out of the country I asked, “Where are you?” He told me Ireland. The ratings were coming out that day. So he called from across the Atlantic Ocean to ask me one question, “Did we get the bastards?” And then he laughed. Year after year, decade after decade, Jim gave himself to his radio audience, everyone of them considered dear friends. He was there during good times and bad. Sunny skies or snow. 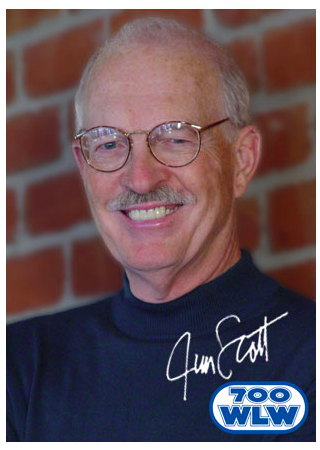 Jim Scott is a radio personality to study and learn from. There will never be another like him. He’s knows radio. He understands his place in the market. Never abuses his power or notoriety. Keenly knows the importance of ratings, the advertiser and revenue. He’s a competitive personality and a radio icon that has survived and flourished ratings book after ratings book because of his ability to adapt and learn from an ever changing marketplace and audience. Jim Scott, a Cincinnati radio legend, will be remembered along with people like Powel Crosley, Bob Braun, Ruth Lyons, Gary Burbank, Bob Trumpy and Randy Michaels. Let me ask and answer that question one final time. Jim. Did you get the bastards? Be very proud…and sleep in! You mean, there really were local radio personalities?! Okay, here’s an observation that is intended to be positive: I listened to Bob Conners on WTVN regularly (but not his replacement, who I find very pedestrian) and Jim Scott semi-regularly so forgive this observation if it is off. Conners’ brilliance was that said very little and let others do the talking. I analogize his technique to being kind of a Clint Eastwood of the radio. He was kind of a minimalist in what he said, but it was very effective in communicating to the public. Powerful. I looked at Scott in a similar manner. Low key, not making himself the center of attention, and just as powerful in his communication skills. It’s hard to believe Scott was a political science major, since he seemed to make a study in being innocuously friendly. wanted to do something different, play music again, I guess. Wasn’t that the station Randy Michaels or somebody associated bought out in a very few months and immediately put Scott back in his familiar role? Way to go Jim! Hate to age both of us but I grew up with Jim listening on my little AM transistor radio and then again listening nearly every morning on 700 on a much better radio. Enjoy your retirement. I too likes many more consider you my friend. God Bless. I guess we all knew this day would come. Jim is one of the very best and such a good person. He really does talk to everyone he meets on the street or in a restaurant. He deserves some sleeping in time. When I came to work at WLW in 1988 Jim was one of the first to welcome me. He wanted to make sure I had settled in and found a place to live and made it a point to find out about the Wife and Kids. I ALWAYS enjoyed working with Jim. Jim, here is to a WELL deserved retirement. Cincinnati radio WILL be poorer in your absence. From 1967 to 71, we listened to Jim every morning, carpooling to St X in Finneytown. He was on WSAI 1360, playin the hits with a genial, upbeat attitude, a great morning man. Glad you enjoyed such a long, successful run, Jim, and got to plan your own exit. Most of us don’t get to. One morning Bob Connors was interviewing Jeff Rapp, a Columbus sports guy, right after his retirement was announced and Jeff was congratulating Connors on a great career and “being able to go out on his own terms”. Bob’s response was, “Well, not really.” Was Jim Scott “retired” in the same way Bob Connors was “retired” from WTVN by Clear Channel? The rumor in Columbus is that Joel Riley must have pictures of one of the Mays’ or someone in the chain of command screwing a horse because he keeps getting these talk gigs even though he is very painful to listen to. He is an okay radio DJ, but painful as a talk radio host. Matt Patrick from Akron was whacked by CC at roughly the same time. I don’t know what his skills were like as a radio host, but he had one hell of a voice which, even if the content isn’t there, makes listening tolerable. I always thought WTVN should have gone after him instead of letting him go to Texas. When I listen to Joel, I feel like I’m listening to a station in Beckley, West Virginia or Ocala, Florida instead of some reasonably large city. I started listening to WLW several years ago, and enjoyed listening to Jim from the start. But I’ve always liked Mike as well. And he seems to have cooled off on criticizing the callers, so I think he’ll do alright. I do enjoy the crazy stories he digs up. Mike is the correct choice for mornings and to take over for Jim. My opinion! Not that I had a say. LOL.